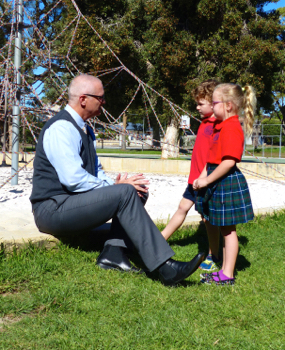 It is my privilege to welcome you to the Glengarry Primary School website – a tool designed to assist you in learning about our school and enhance the opportunities for our current community to be kept informed of ongoing events. I trust you find the site of benefit prior to and during your time with us. Glengarry Primary School was established in 1980 and has seen a great deal of change in that time, including gaining Independent Public School status in 2014. We acknowledge and celebrate our past and balance this with a sense of moving forward, embracing innovation and current educational thinking. Our desire to implement pedagogical best practice including well resourced technology (interactive whiteboards across the school), use of instructional strategies to maximise individual potential (i.e. goal setting) in a team orientated environment, will see students equipped with the necessary tools for a changing society and with the ability to think independently. Glengarry Primary School aspires to enhance a well rounded student, not only highly literate and numerate but also extremely competent with information and communication technology, an appreciation for the rights of others and respect for themselves. Glengarry Primary School has a comprehensive behaviour management program in place that is based on the principle that "every teacher has the right to teach and every student has the right to learn". Our Behaviour Management policy creates a supportive, non-threatening environment in which inappropriate and disruptive behaviour is kept to an absolute minimum. A dress code, strongly supported by parents, assists in the promotion of school spirit and school identity. Parent involvement in the school and participation in decision making is welcomed with parents having a major role to play in many of the school's programs. Glengarry is staffed by a group of experienced, dedicated teachers who are constantly adding to their repertoire of teaching strategies and knowledge of current best practice to cater for the students' different learning styles. A group of highly committed non-teaching staff work together with the teachers to deliver an effective education program. At our school “WE CARE”, and my personal mantra of “TRY” (trust, respect, yearn to learn) endorses the core values that are embedded across the school. I expect all students to “have-a-go” and with the support of the learning community around them (staff, peers and carers) endeavour to maximise their potential.